Use reasoning skills in six challenging dilemmas with your child's favorite Pixar Pals. Appropriate for children ages 4 to 7 years (grades pre-K to 1). Works With: LeapPad Platinum, LeapPad Ultra, LeapPad1, LeapPad2, LeapPad3, Leapster Explorer, LeapsterGS Explorer. Complete challenges, solve puzzles and unlock mini-games with WALL-E and EVE, Nemo and Dory, and Woody and Buzz! 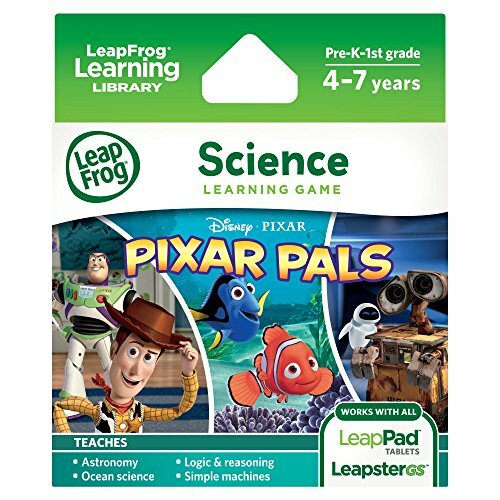 Blast into the future to create a model of the solar system, and sort trash and recycling with the ever-curious WALL-E.
Help Woody and Buzz put trains on the right track, and explore levers, pulleys and springs in an alien training mission. A sea of learning. Dive into Dory's ocean habitat to learn about sea life, and help baby sea creatures find their parents. Skills learned include sorting & classifying, environmental science, logic & reasoning, thinking like a scientist, and ocean science.